When you launch a new feature update it’s an exciting time for your business. Yet, it can be difficult to know how to communicate this information to your current customers.This is a problem many customer success specialists, account managers, and product marketers encounter. They aren’t sure how to promote feature updates to customers in order to get the best engagement and adoption rates. To guide you through the process, here are 6 powerful ways top businesses spread the word about their new feature launches to customers. Test them out and see if they work for you. Secondly, you can segment your audience based on how they use your product allowing you to send more personalized emails. For example, if they use similar features you can explain how this new one could help them. Or if they need to upgrade their plan to access this feature, you can send an email that focuses on the upsell. Finally, if you’re a customer success specialist or account manager who has a close relationship with your customers, individual emails might be the best option for you. Although they’re a little more time-consuming, a more personal touch in your emails can lead to higher open rates and, in turn, higher adoption. A prized tactic when you’re a software company is the ability to communicate with your users when they’re using your product with in-app messaging. 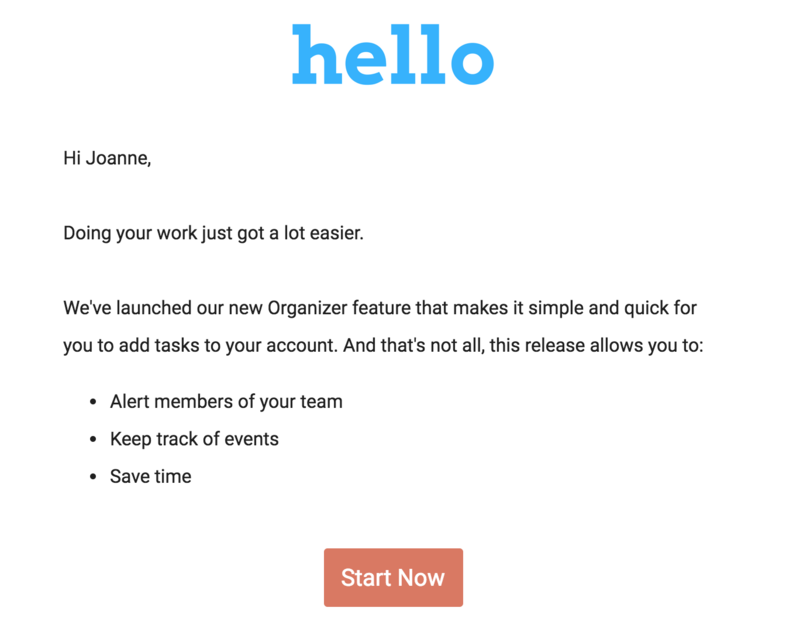 You can send messages while people are engaged with your product, so it’s the perfect time to hit them with a notification about your new launch. Whether it’s a notification on the bottom of the screen that has a link to the new feature itself or a pop-up linking to a help document explaining the new launch there is a high chance this message will reach your customers when they’re ready and receptive to learning about it. If your business has a popular blog, make the most of it. It’s likely that a substantial portion of your readership already use your product, or have a keen interest, making it an invaluable way to spread the word about new launches. Writing a post explaining why this feature is being launched and how it works can provide a story for potential users. Detailing the benefits of the new feature shows your customers how it will improve their experience with your product and make them more likely to try it out. It’s not only important to tell your customers about your new launch, it’s equally critical to show them how to use it. Using a learning management system (LMS) to deliver courses about your new feature can help you do this. You can build step by step courses that show every aspect of the feature so your customers can use it correctly and fully understand the benefit, thus having a major impact on adoption. It’s easy to create courses for your customers with an LMS. You can simply build, upload the course and enroll the customers you want to train. You can even create a customized email to let them know about the new feature with a prompt to start the course on how to use it. Additionally, you can add exams and quizzes to improve knowledge retention and your customers’ chances of success. Another excellent method to launch a feature is to run a webinar. Similar to training courses, it can announce your feature and also show your customers the benefits and best practices to increase adoption. If you have an LMS, running a webinar is straightforward. You can integrate your favorite webinar tool with your LMS and manage everything from enrollments to reports within one system. Here’s a handy guide how. Reaching out to organize a one to one chat with your customers may seem like an obvious option, but it works. A quick customer catch-up with an account manager or success specialist can be very effective for making them aware of new launches. You can also recommend courses, webinars and best practices that once again increase their chances of adoption. To ensure you gain the best results, you can mix and match the methods we’ve covered here. Why not write a blog post that links to your training course? Or run an email campaign that promotes your new feature announcement webinar? The best teams experiment and test in order to find the most effective ways to reach their customers and use this information to constantly improve adoption rates. How do you raise awareness for a new feature launch with your customers? Let us know in the comments below.